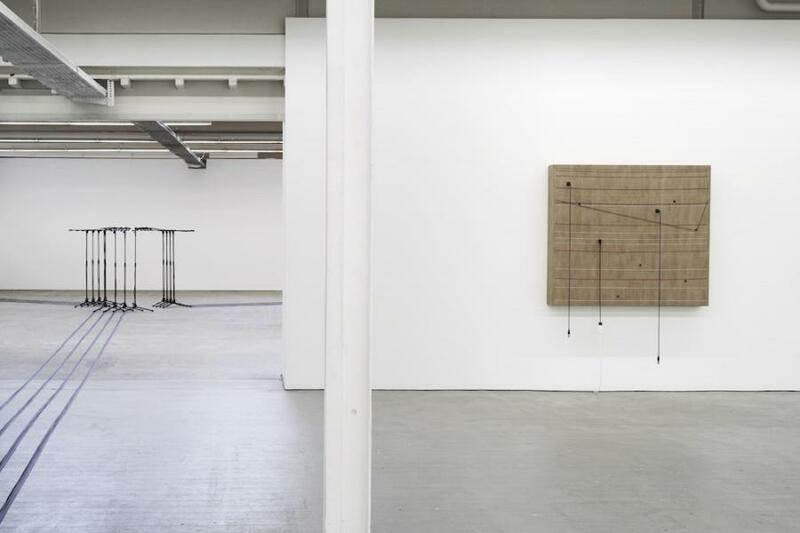 Ines Goldbach (IG): Let us start our conversation about your works like Transition that you are showing here in Basel. At first sight they look similar to paintings and sometimes, from a certain distance, appear like drawings – but on the other hand they act like speakers or even, in their togetherness with the space and the architecture of the Kunsthaus, like a big instrument per se. 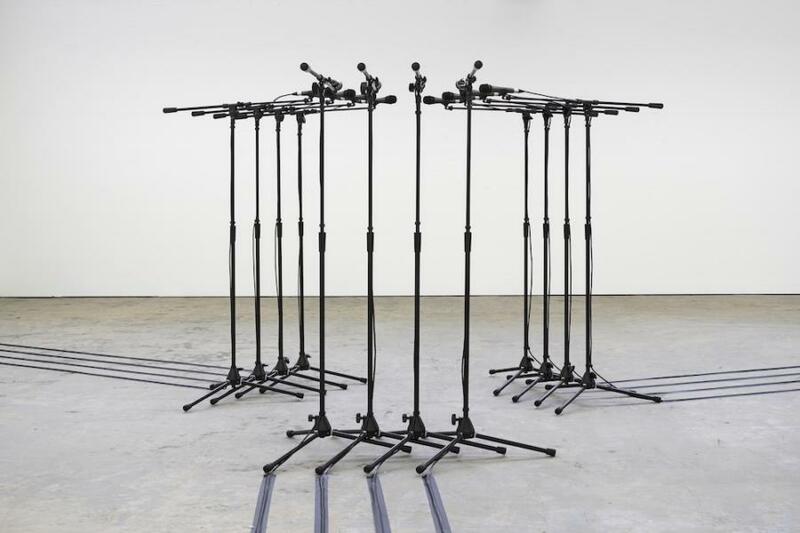 What is the difference for you installing them and seeing them in calm — without any sound — and on the other hand activated and functioning as instruments, filling the space with sound? Naama Tsabar (NT): For each Transition canvas I took apart an amplifier or powered stage monitor. I took out all the internal and external components — the speaker, knobs, wires, circuit board, etc. I extended the existing wires that run in the circuit board using the same colour and gauge of wire. I used the wires and knobs like a painter's palette and made the visual compositions on the canvas. All the wires are puncturing through the canvas and connecting back to the circuit board and speaker at the back of the canvas; that way the amplifier gains a new formal visual existence while still retaining its prior functionality. It's a sculptural painting that has the ability to output sound. The Works on Felt actually double as instruments, when the string that sculpts them is plucked. I‘m interested in these in-between states of existence, when an object can change its reading and field of action by its activation; I feel this expands the existence for the objects, it brings them into a more complex sensual existence, one which is much more in tune with the way we experience life. I don’t like authority, to be framed — restricted; these works break the borders that were set for them. They do this by possessing the potential to expand into a different field of action; they are in constant states of transition. IG: On the one hand you open your works to the public — viewers are invited to activate your works — nearly anybody that enters the space. On the other hand, if we are talking about your music-performance, only women are activating the works and filling the space with thier bodies and the sound from the works. What is the difference for you in that? NT: On a sensual level I am interested in all viewers having an intimate physical experience with the work, if they choose to cross this border between their bodies and the objects. When we perform the work there are rehearsals involved, learning how to play the pieces; this is a form of mastery, and with that in mind I am very aware of the gender imbalance in the cultural sphere. I am interested in inserting the works into a new gendered history, one which is not male-centric. I choose predominantly to work with women and gender non binary musicians and performers; a male musician needs to be really good and evolved and to meet our high standards to be considered as a performer. IG: Saying that, let me go more into detail. If we talk about all the means that create an installation — speakers, amplifiers, piano strings, microphones, etc. — it sounds very technical. In the way you use them and activate them by women‘s bodies they become very poetic, fluid, soft, powerful. I wonder if this is a possibility to open certain means that belong in an idealistic way to people of all genders? NT: Yes, it is a way to insert the works into a new gendered history, to give a stage and a voice to those who have been overlooked and underestimated. IG: I think there is a certain issue trying to find the right notion regarding your work; it turns out to be quite difficult — there is sound, music, body, space, architecture, painting, objects, performance, gender. Are these multimedias a way to cross and somehow leave behind all the borders that we have built up within the last decades of art history? NT: I view my practice like a stream, a natural river of sorts — having its own border while passing through those decided on and artificially put in by man. IG: Thinking of the context in which the works might be embedded, and looking to your Works On Felt, there is a very strong visual connection to the felt works by Robert Morris from the 1960s and 1970s — although he very rarely, maybe never, used felts in colour and of course there was no possibility of activating them and playing them as instruments. There was as well never the possibility of touching them. 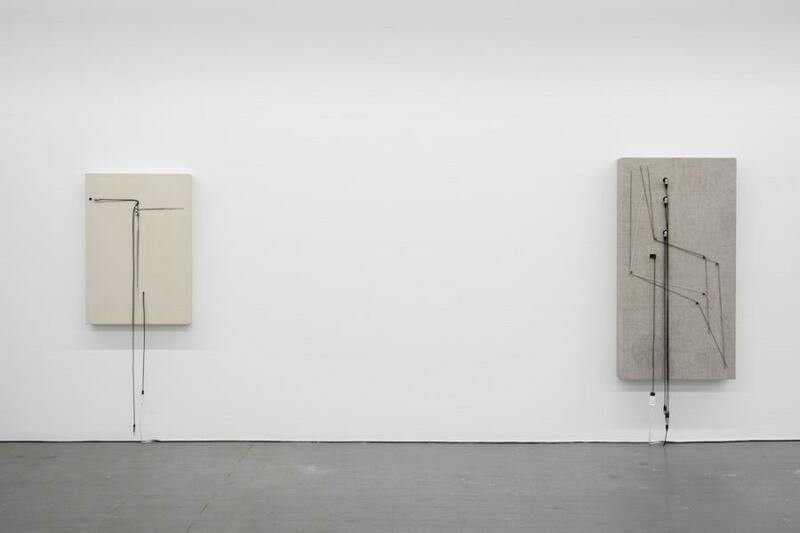 How do you refer to this reference and is it a possibility of extending and open up this understanding of contemporary sculpture or objects? 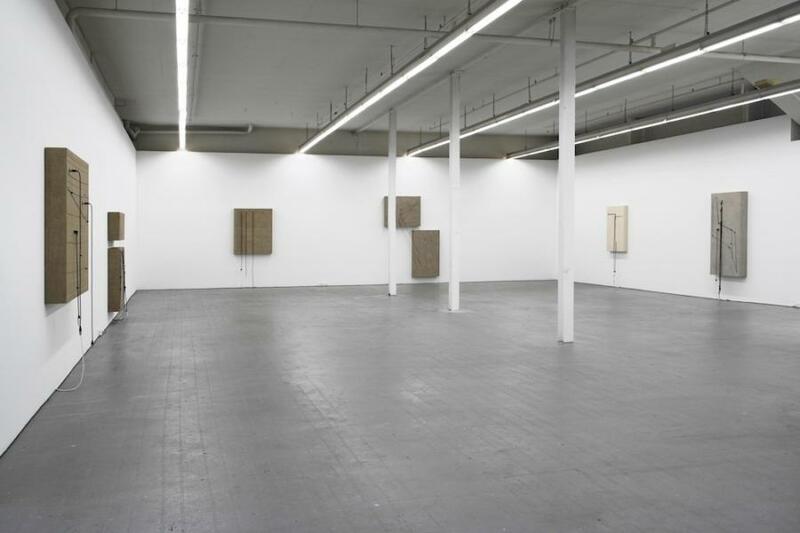 NT: My first art historical references for the felt pieces were Joseph Beuys and Robert Morris; yes, you‘re right. 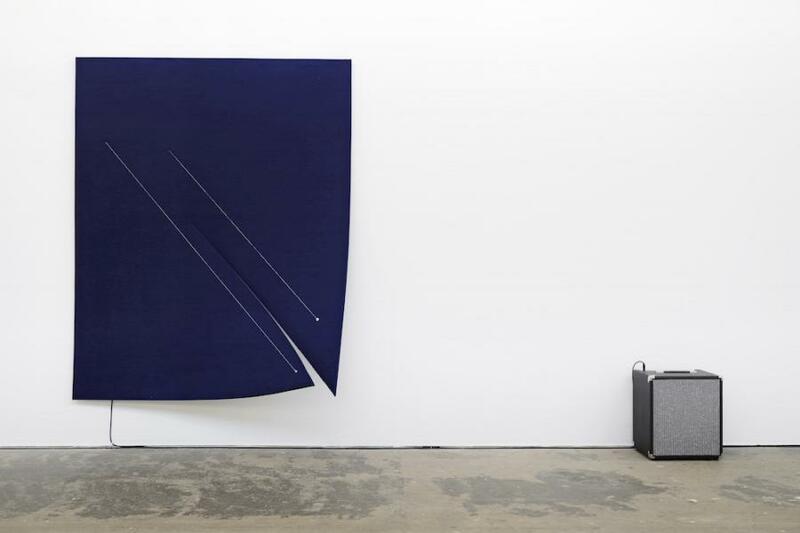 Beuys for the performative qualities and the use of felt as a deadener of sound, and Morris for his formal gravity-sculpted felts. 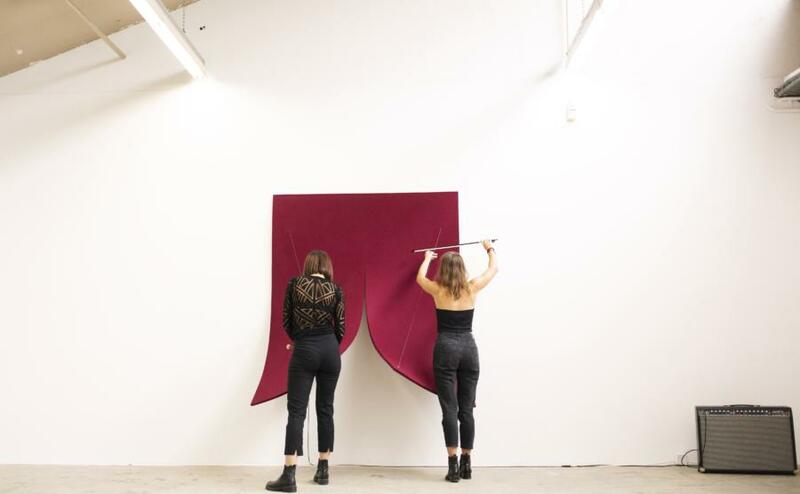 My Works On Felt are a move away from both predecessors — through the embedding of carbon fiber in the felt, the soft material gains the ability to retain high tension and hold a form. It now looks like felt but acts like another material. 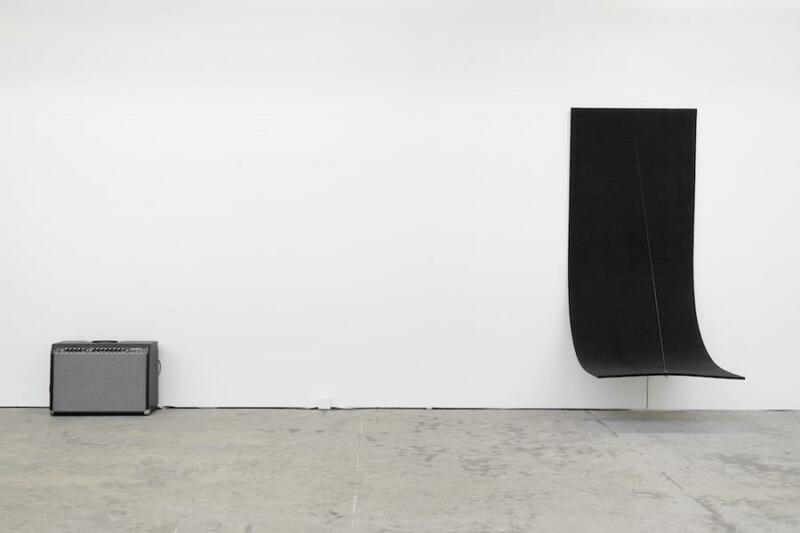 When the string is plucked the felt carbon fiber duo become the – sound chamber itself, and the tension of the string is that which sculpts and holds the form; in a way these are forms created by the resistance to gravity. 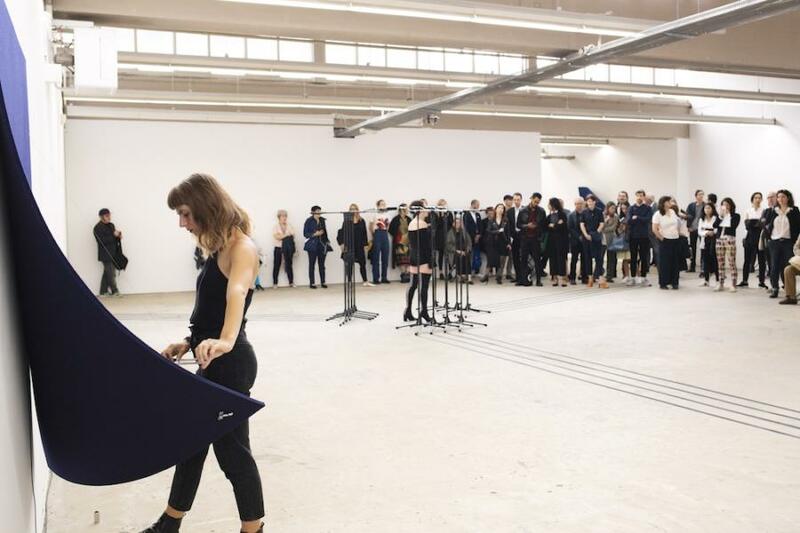 In addition, with the interactiveness of the work there is a question of the place of the viewer — or rather, the viewer who shifts to the performer after activating the work. 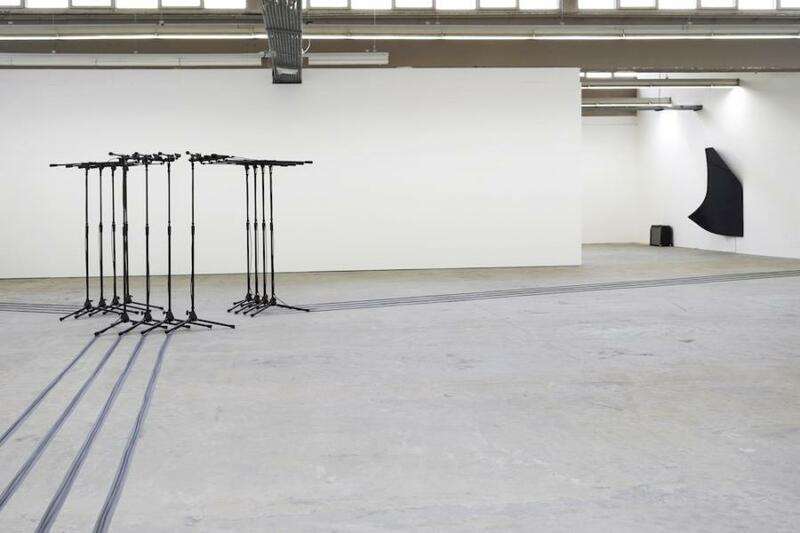 It constitutes at once both an intimate relationship between viewer and work and a public stage-like relationship between one viewer and the next. 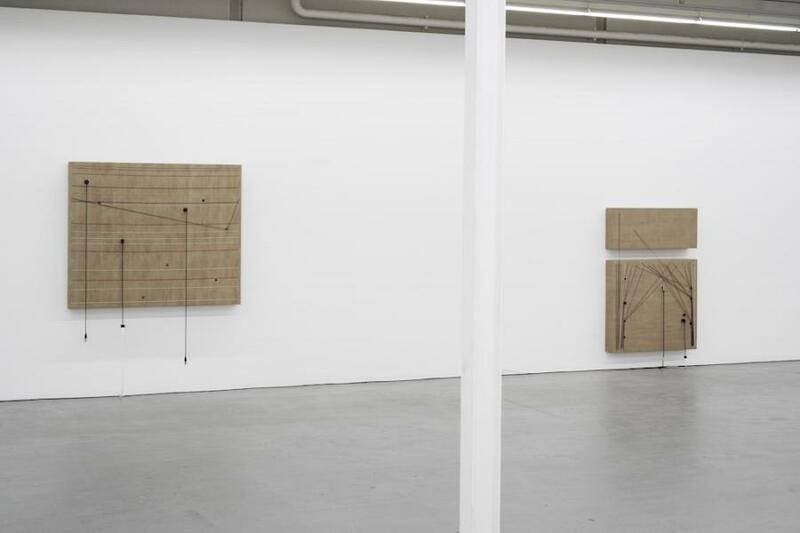 And of course there is the relationship between the art object and the sound wave, which also constitutes part of the sculpture — hence the viewer plucking a string also extends the borders of the work, sending a wave of sound to propagate through the exhibition space. IG: It sounds to me as if your work opens up not only a new understanding as to how to use works of art but also, above all, how to generate a new relation to artworks that within the last maybe twenty years became, in a broad sense and on so many occasions, a fetish: something to be admired, to be marketed and sold and installed on private and public walls. Are your works an attempt to create a space for the viewer, to include him/her in a very sensual way and to activate him/her from a viewer to a participant? NT: I hope my works offer a more intimate relationship and experience for their audience. The works don't offer that relationship right away. At first they do appear to follow the same rules of sight and display put in place by years of art history and they can be installed on private and public walls. However, when they are activated and those borders are breached they can also offer a more specific and sensual experince and relationship between sculpture and body. For example, I have recently learned that one of my felt works that is in a private collection and on display in a house is also being played with regularly by the children of that collector — they‘re learning how to play with a big piece of felt! Another aspect to this is that the work also gains a visual history through these interactions and through its use. When we perfrom on the works at times we leave marks of action on the felt, this is for me an exciting moment where the surface of the work responds back to our actions, and a mark is left of a movement that has taken place, it is now an integral part of the work. IG: Mentioning Joseph Beuys, I wonder if artworks and exhibitions that include the viewer, with movement and being present in the space, bring us to the point that art is more about (sensual) experience and how we navigate through spaces, not only architectural-wise but also thematic-wise, regarding the crossing of (social) boundaries? NT: Yes, I believe so. In a way I think it‘s also about a new understanding of space and a flow put in place in the 21st century by online platforms and new means of communicating. I am trying to bring those ideas back into the material form, back to our bodies. The exhibition were generously supported by artis grant program, Ostrovsky family fund, Paramo Gallery, Paul Kasmin Gallery, Dr. Georg und Josi Guggenheim Stiftung, Isaac Dreyfus Bernheim Stiftung, Ruth und Paul Wallach Stiftung, Dvir Gallery and Spinello Projects as well as the partners of Kunsthaus Baselland: kulturelles.bl, Gemeinde Muttenz, Migros Kulturprozent, burckhardtpartner, Anthony Vischer and werner sutter AG. 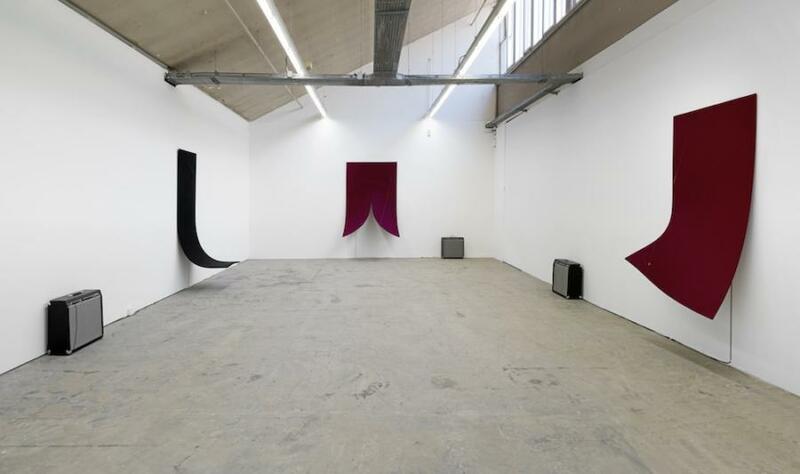 During Naama Tsabar's exhibition the two solo exhibitions by Rossella Biscotti and Rochelle Feinstein were also on display.